I just had the opportunity to review the most recent release, Every Soul's A Star, from Dave Keller and it's a solid R&B entry. Opening with Don't Let Them Take Your Joy, a poppy R&B track, Dave Keller leads a super band on vocal and guitar with excellent backing from Bob Trenchard on bass, Johnny McGhee on guitar, Dan Ferguson on keys, Richy Puga on drums, Mike Middleton on trumpet and Nick Flood on sax. Solid opener. 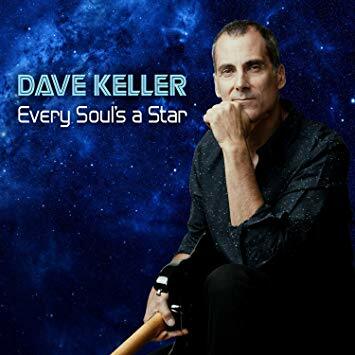 On title track, Every Soul's A Star, a warm horn intro leads the way for Keller's soulful vocals and nice backing vocals by Janelle Thompson and Shakara Weston. Digging down into the funk, Ronnie Shannon's Baby, I Love You has a great sound. I really love Aretha's version of this, but I really like this one as well with a slower, more powerful bottom and bluesy guitar riffs. Very cool. Another solid R&B track, Freedom Is Ours is another solid vocal track which benefits nicely from the horn work of Middleton and Flood. Up-tempo, It's All In Your Eyes, has a great melody with just the right organ underpinning supporting super vocals and effortless guitar soloing by Keller. Soul track, When Are You Gonna Cry is one of my release favorites with a particularly memorable melody, strong vocals by Keller and nicely phrased guitar riffs and horn punctuation punching the track up. Wrapping the release is Ain't Giving In with a fusion of funk and R&B with a strong melody and balanced vocals and horns, with snappy percussion. Very nice.